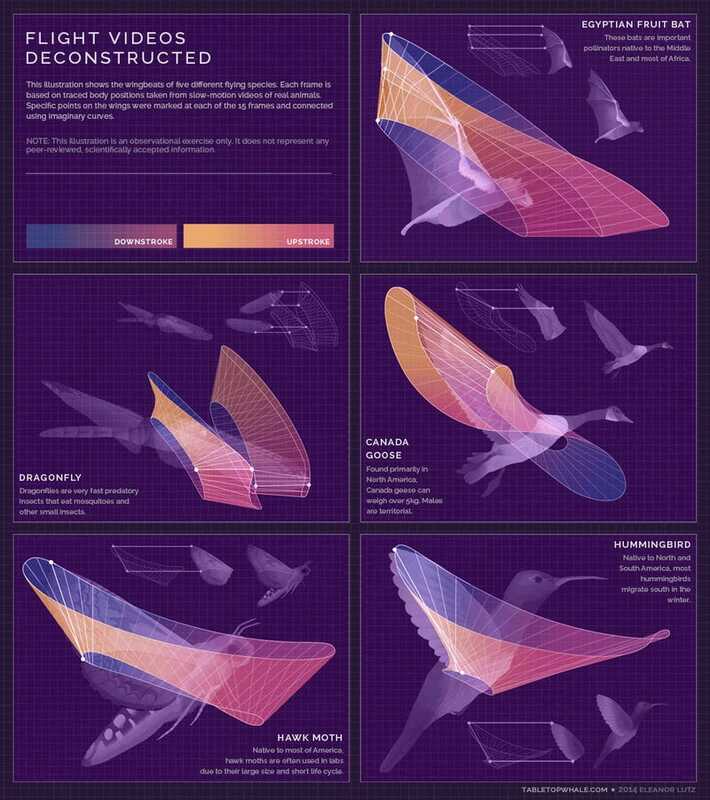 Designer Eleanor Lutz used high-speed nature footage, Photoshop, and Illustrator to map the wingbeats of five different species. The result is a visually arresting confluence of art and science that reveals the patterns hidden in animal flight. Trust us on this one – you'll want to see this. "It took a really long time to find the videos, because they had to be in slow motion, high enough quality, and also shoot the animal during one continuous wingbeat of flight from a reasonable angle," says Lutz, who blogs at Tabletop Whale. "After I found the videos, I extracted 15 frames of film from one wingbeat," she explains. I stabilized the animation by positioning each animal at the same place on the screen based on the position of the center of their thorax. After that it was relatively easy - I just traced each of the 15 frames to get a continuous flying loop." 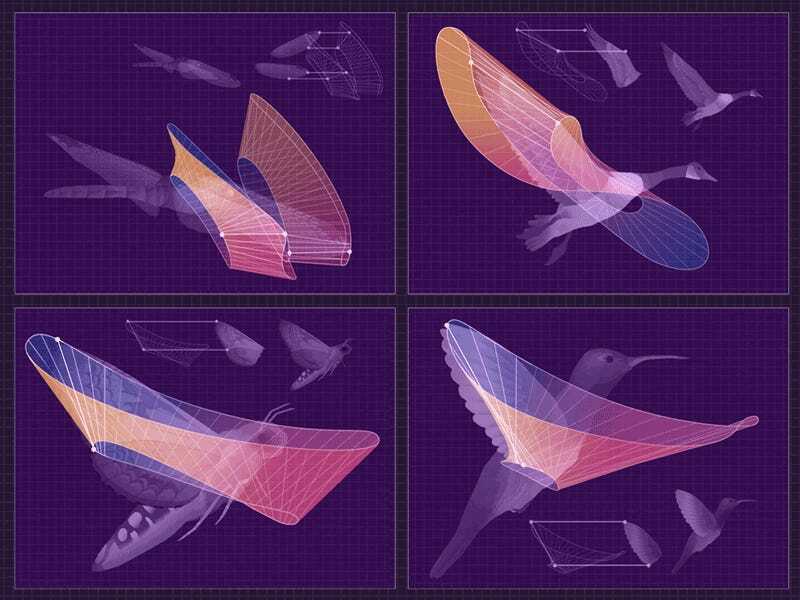 To get the curves you see in the animation, Lutz plotted five or six points from the wings of each animal during its respective flight sequence, picked whichever points moved in the smoothest curve, and linked them together in Illustrator. The result is a visualization that Lutz admits is more art than science ("an observational exercise only," she notes, not "peer reviewed, scientifically accepted information"), but I took the liberty of contacting some experts in flight kinematics, and they had good things to say about it. Richard Bomphrey, who studies the biomechanics of insect flight at the University of Oxford, called the visualizations beautiful. "It is a step in the right direction towards the type of data the pros use," he says, "but more decoratively presented." However, he notes, the visualization "can definitely be used to highlight some interesting features." The two major things that impress me about the graphic relate to convergent evolution [the independent development of similar features in organisms from different evolutionary lineages] and dynamic morphing. 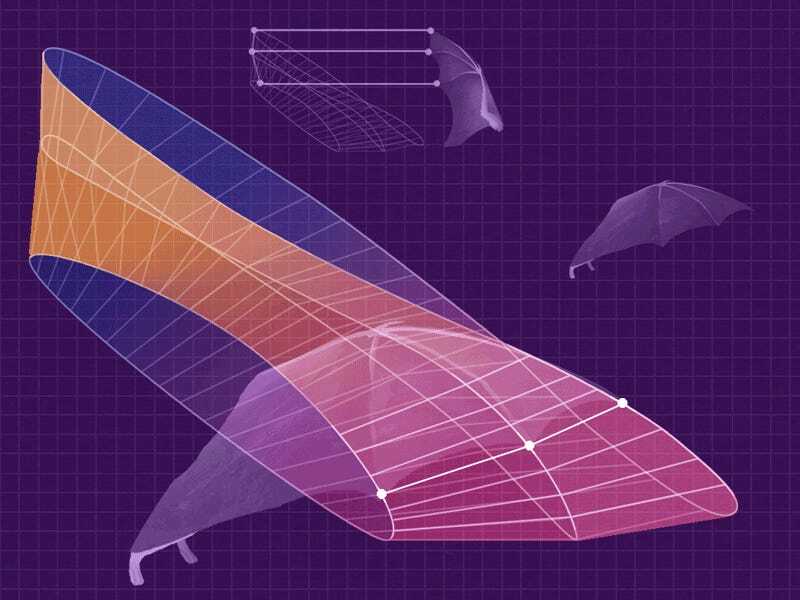 In terms of convergence, the hawkmoth and hummingbird patterns are similar, and the bat and goose patterns are similar. One can tell the moth and hummingbird are hovering, and the bat and goose are engaged in slow forward flight. It is amazing that such dramatically different morphologies (muscles, skeleton and external covering) give rise to such similar patterns. In terms of dynamic morphing, it is aesthetically appealing that the wings of all the animals change shape at every instant of the animation, closely reflecting the reality of the way animals perform flapping flight. The dragonfly underscores how an organism that at first glance seems to be simple is actually stunning in its complexity. Whether you come at it from a scientific angle, or an artistic one, Lutz's visualization is a fine piece of work – the latest in her growing collection.